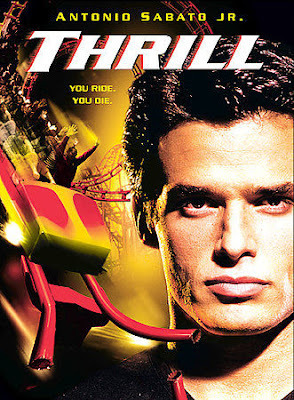 It’s terror on the log flume as fan favorite Antonio Sabato Jr. snaps into action in this made-for-TV “thriller”, originally aired on NBC. 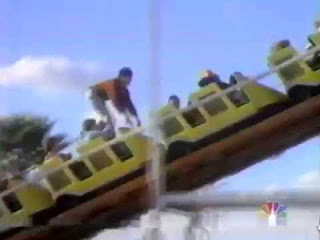 While the obvious play here for the filmmakers was to ape Speed (1994) – except make it a rollercoaster instead of a bus – and cross-pollinate that with Beverly Hills Cop III (1994), strangely, they really only opted for the former, and even then it’s only the climax of the movie. No terrorists take over the park, and there are no amusement park goons for Sabato to fight. It’s mainly just tourists wearing fanny packs and brightly-colored shirts walking around the Santa Cruz Beach Boardwalk. It’s not really a “whodunit”, because we very swiftly know who “dunnit” too early on. It’s mainly about a Fred Dryer-less Stepfanie Kramer sorting out the park’s financial matters while Sabato takes care of his daughter and forges a relationship with the fortune teller. Occasionally he intercedes to help people off a runaway floom, but Thrill really is a textbook study in lost potential. Really, think about all the ways Sabato could outsmart baddies and kill them in an amusement park. The possibilities are endless. Yet that’s not the route they decided to go here. We realize it’s a TV movie but they still could have done it that way. Part of the fact that the amusement park is a family business is that Jack lets his daughter – who is a classic young tot, as we call them – just walk around the park with the staff. That includes an older Black gentleman played by Bill Cobbs – not to be confused with another NBC star at the time, Bill Cosby. Letting your daughter go off with him would be a colossally bad idea. But Norm (Cobbs) wears a bowtie and is harmless. Or is he? Regardless, he’s a ride operator who uses what looks like an Apple IIGS to control the ‘coaster. No wonder they’re having problems. There’s also a Star Tours-like ride where patrons get in a windowless van and rock around while viewing CD-ROM technology. No wonder they’re having problems. Of course, it all comes to a head during a death-defying fight on the Thrill coaster between Jack Colson and the baddie. Did you think it would end some other way? For a TV movie that promises far more action than it delivers, Thrill is actually not that bad. Sabato and the daughter are likable, there is plenty of 90’s fashion and tech on display, there’s a rockin’ intro with kids on skateboards aggro’ing it up around the park, and Sabato has a dream sequence involving the local mime. That right there might be worth investigation. Yes, we would have liked a more paramilitary-style Sabato crushing some heads in the tilt-a-whirl, but if we can’t have that, Thrill – while actually far less than thrilling – delivers the next best thing.